Life As It Should Be: Guys FYI- How to Say "I'm Sorry"
Woman can be difficult to please and even more difficult to apologize to to so here are some helpful tips on getting yourself back on the right track. Send her a bouquet of Edible Arrangements- they make beautiful arrangements with fruits and its' not your typical bouquet of flowers. Write her a letter- if you're good with words but unable to express yourself than write down your thoughts. 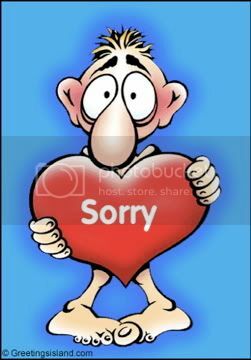 How you apologize is important- Have you ever said sorry and had no idea what you were sorry about? It is not enough to say you're sorry, you have to acknowledge what made her upset and be genuine with your apology! Make her laugh! -even when a woman is mad she still wants to laugh. If you can do that, you've got it in the bag! And of course gifts are always great- buy her something she has been wanting, or even something sentimental that only you two would understand the significance of.